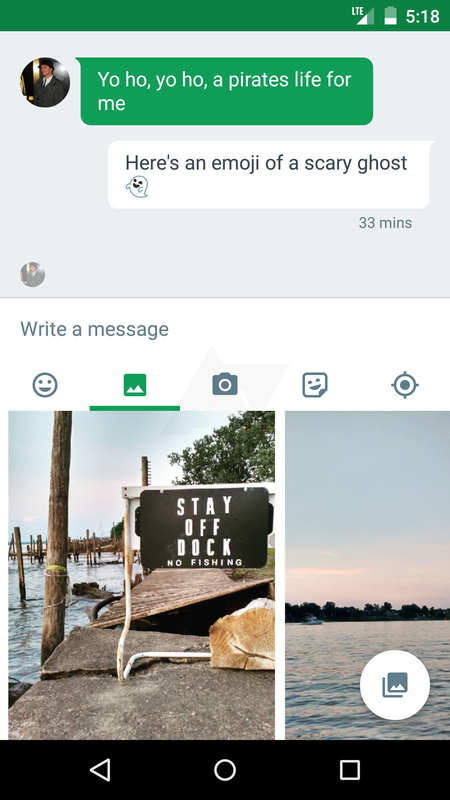 Back in September, Hangouts switched from gray to green in its 2.3 update, ostensibly making the first baby steps on its journey toward joining Google's material design parade. 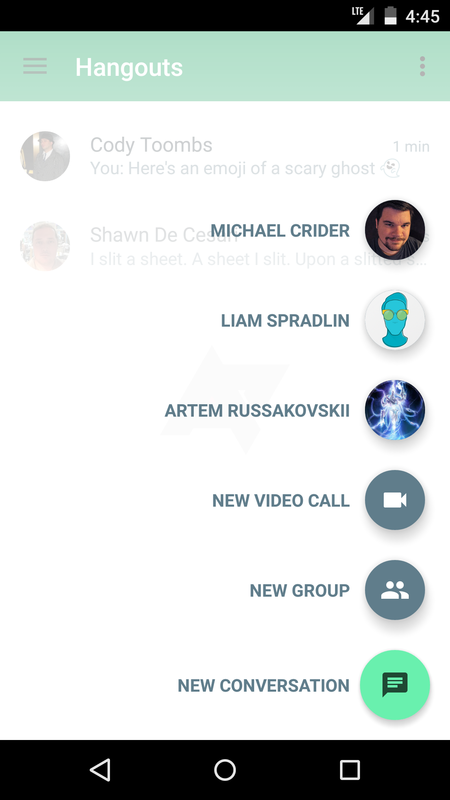 Then in December we first spied a slightly more material version of the app. Now, users are running version 3.3 and many aren't satisfied with the app's layouts or structure. 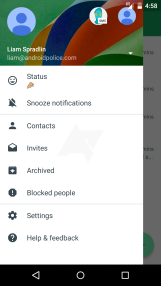 Things like the seemingly unnecessary contacts tab, the somewhat messy drawer, and the non-standard toolbar are common complaints. 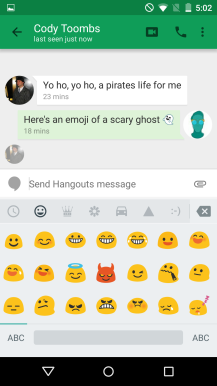 It looks like Google is working on fixing a lot of issues with an upcoming update to Hangouts 4.0 though. 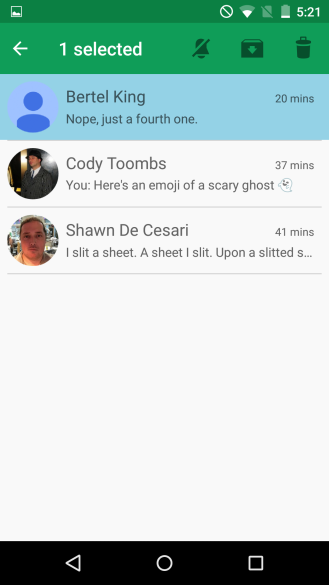 We've heard rumblings from Reddit of the new update, and now we've got an early look at the app. 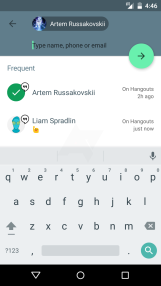 As with our last Hangouts preview, this post will represent the app in its current state, according to information available to us. 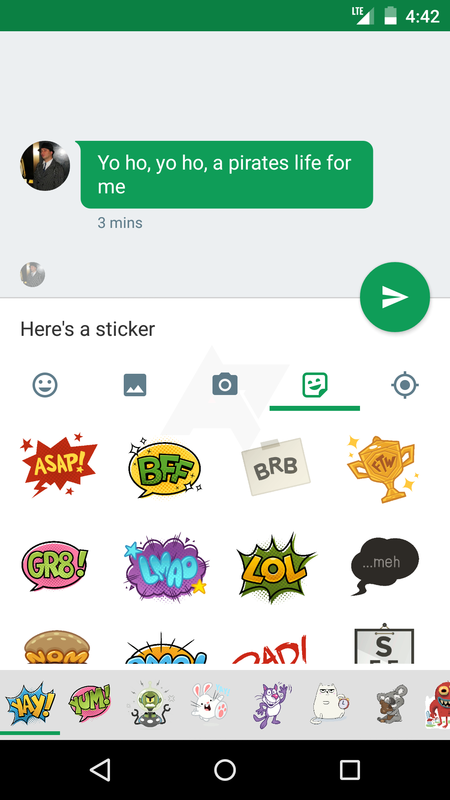 Is this the update that will finally "fix" Hangouts? 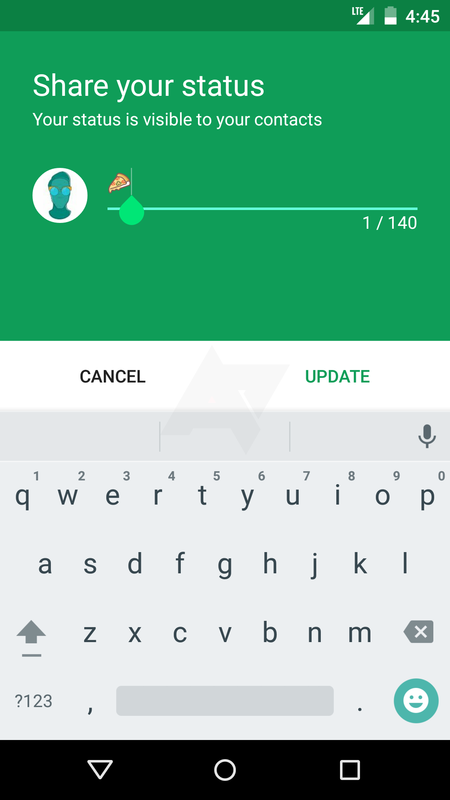 If you believe that an update can really make an app perfect for all users, it's still too early to tell. 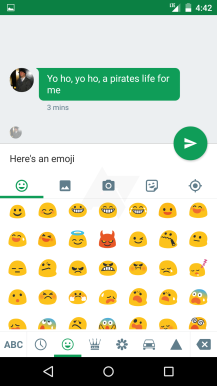 As always, anything could change before release. After Hangouts' new loading screen, the first thing you'll notice about the app is that there are no more tabs unless you have Hangouts Dialer installed. 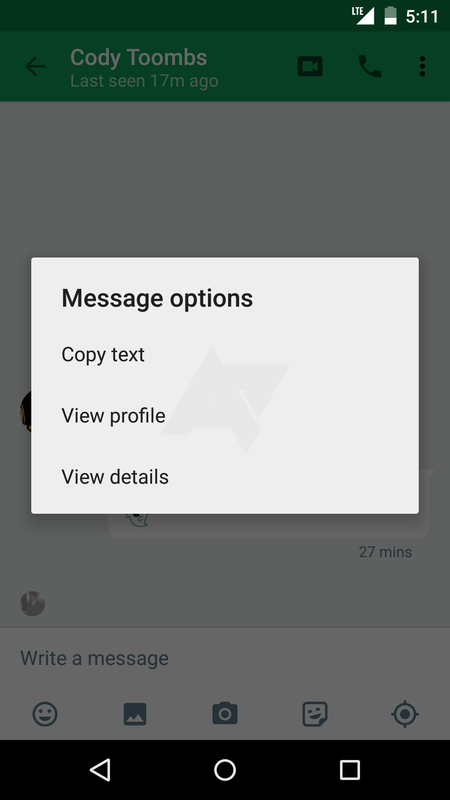 The avatar and signed-in name/email address are also gone, replaced by a toast message when you enter the main screen. 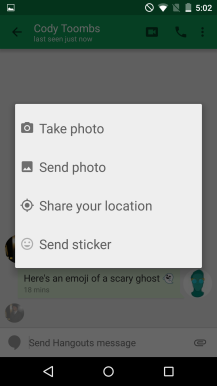 There is, however, a new floating action button. 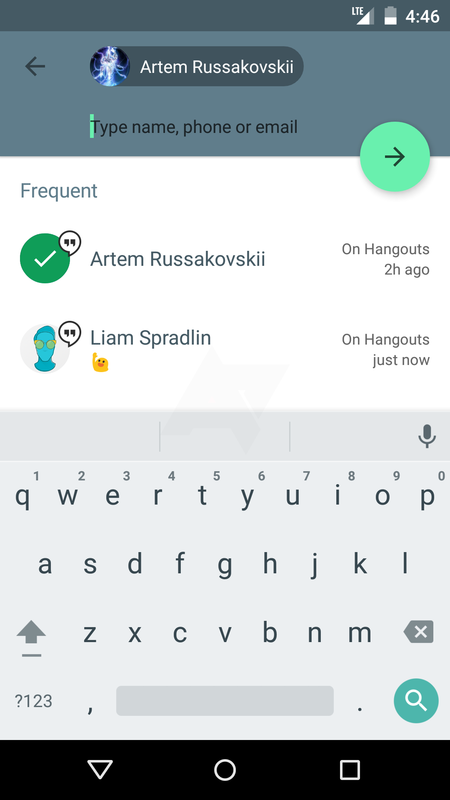 The button opens up a series of mini-FABs that offer three speed dial options as well as options for new video call, new SMS (if applicable), new group, or just new conversation. The contacts tab has basically migrated into the drawer, but you can actually access contacts from the drawer or the FAB. 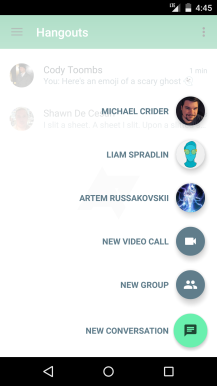 If you access it from the drawer it's a familiar looking list of contacts that trigger contact cards. 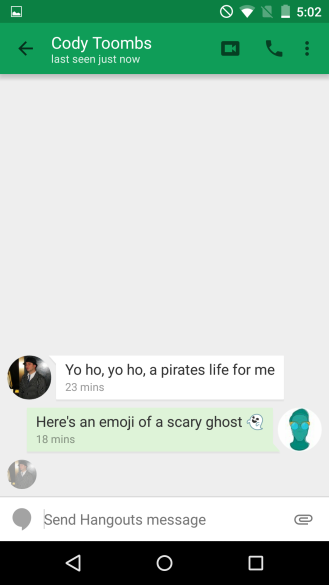 From the FAB, the list triggers a new conversation with the selected contact. 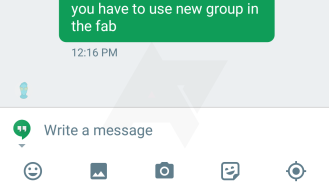 If you want to start a group conversation, you'll need to hit "new group" in the FAB or in the overflow inside a specific conversation. 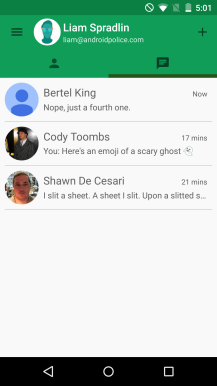 This triggers the same list, but allows users to select multiple contacts before starting the conversation. 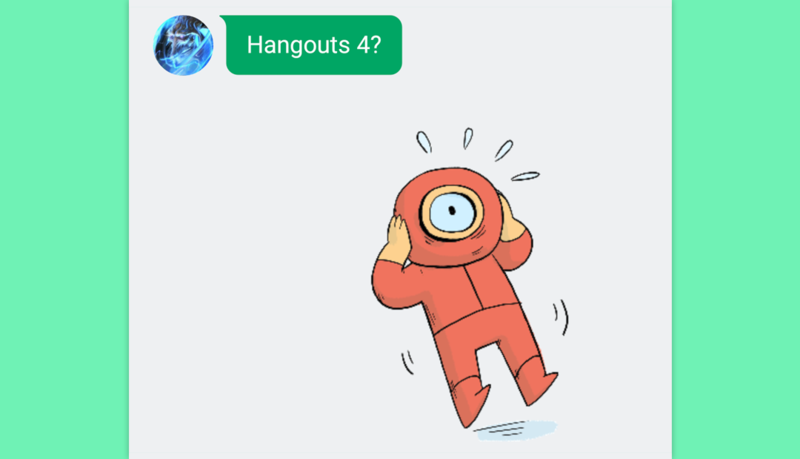 As a refresher, the current Hangouts provides an "Anyone else?" prompt when starting/opening a conversation from its list. When a conversation is selected, Hangouts 4.0 ditches the trash can icon, instead putting the delete action in an overflow menu with a "notify" option that essentially marks the conversation unread. 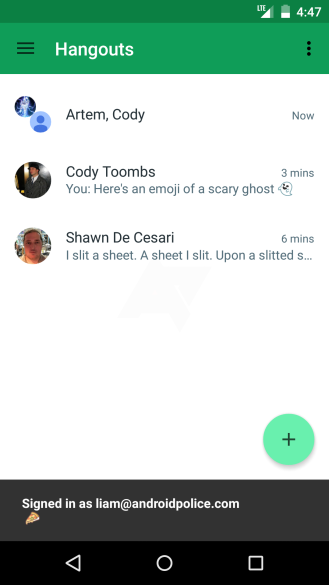 If you're in a group conversation and decide to mute notifications, Hangouts no longer shows a big red bar inside the conversation - instead a snackbar will remind you for a moment that notifications are muted, and then disappear. 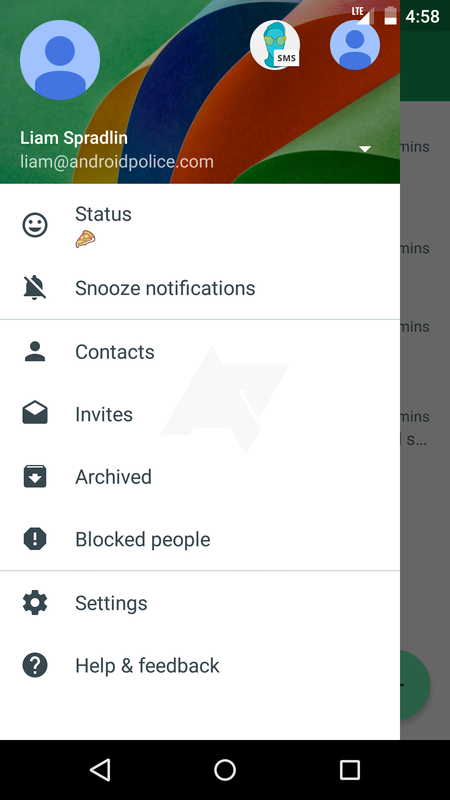 Other than contacts, the only new item in the drawer we've found is a "status" option, where users can set their status for others to see in their own contacts lists. 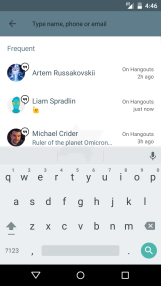 This is a feature that's been visible on the web for a while, but not on mobile. Users will be reminded of their status (and which account they're using) when returning to the home screen courtesy of a snackbar message. 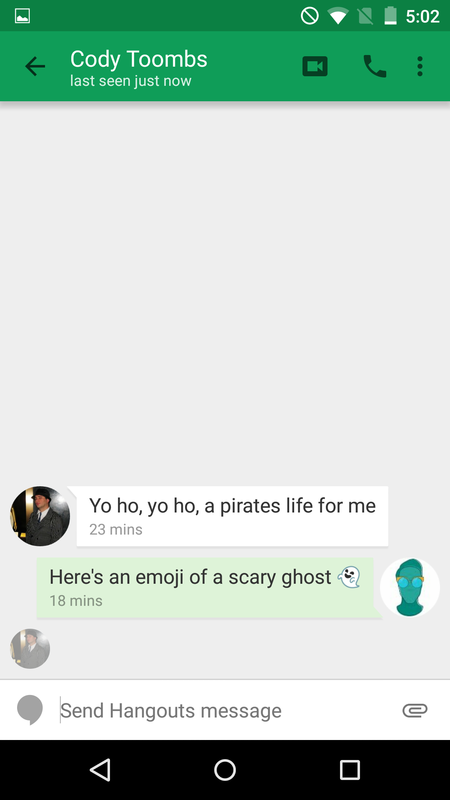 Inside an actual chat, everything has been tidied up. 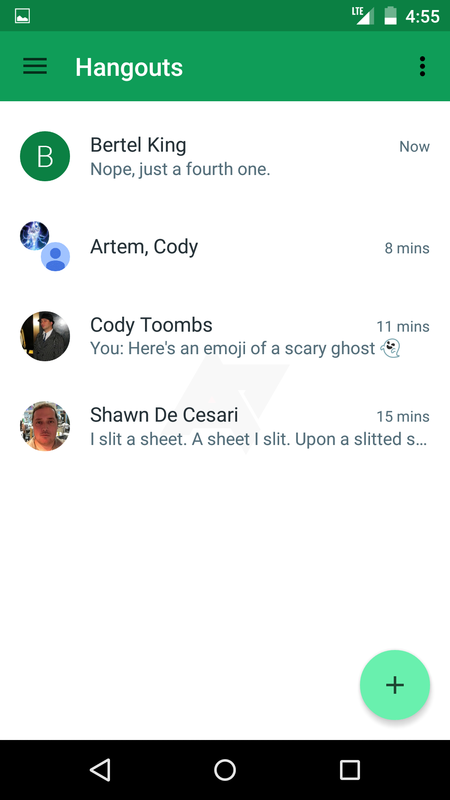 Overall, the chat interface seems to make slightly better use of space, with several tweaks that keep things feeling cohesive. 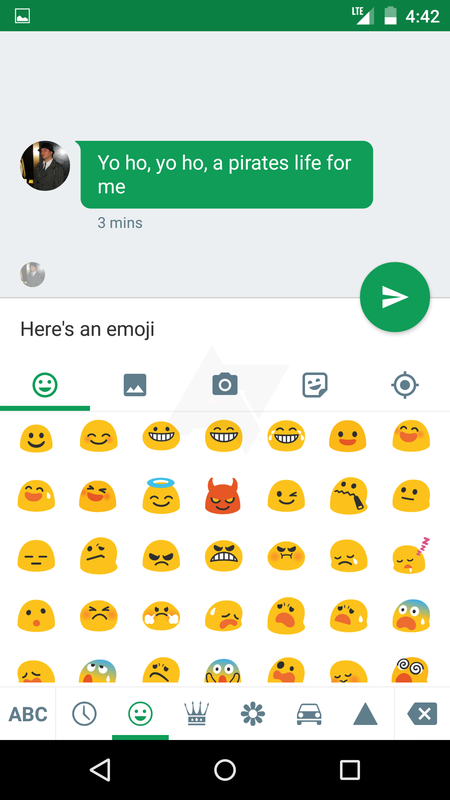 Your outgoing messages are now white, while incoming ones are green. 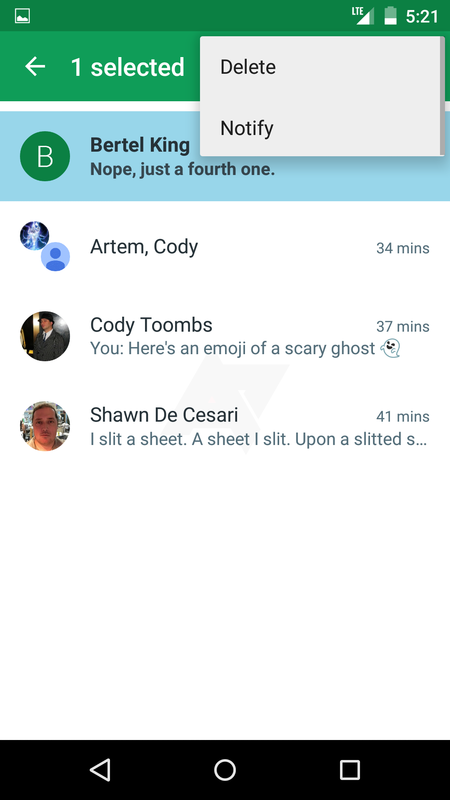 Additionally, your avatar no longer appears in chats, and time stamps are not included with each message, instead appearing sporadically throughout the message stream. 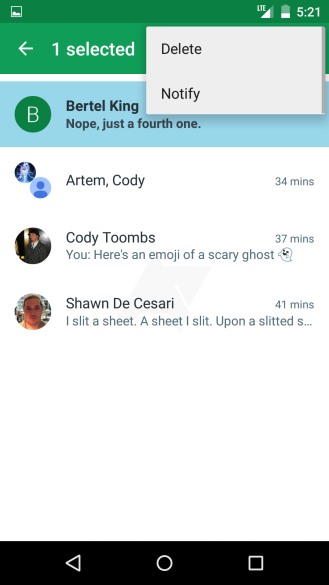 The message bubbles also have pleasing rounded corners. 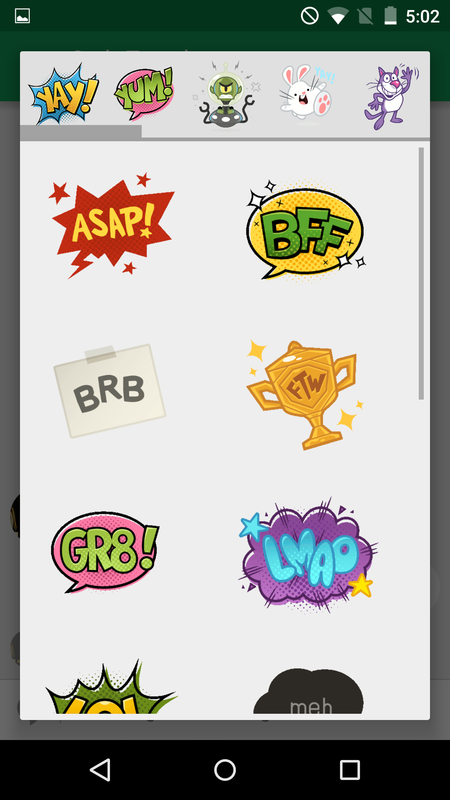 Rather than a paperclip icon, users get a whole row of attachment options for images, stickers, emojis, etc. 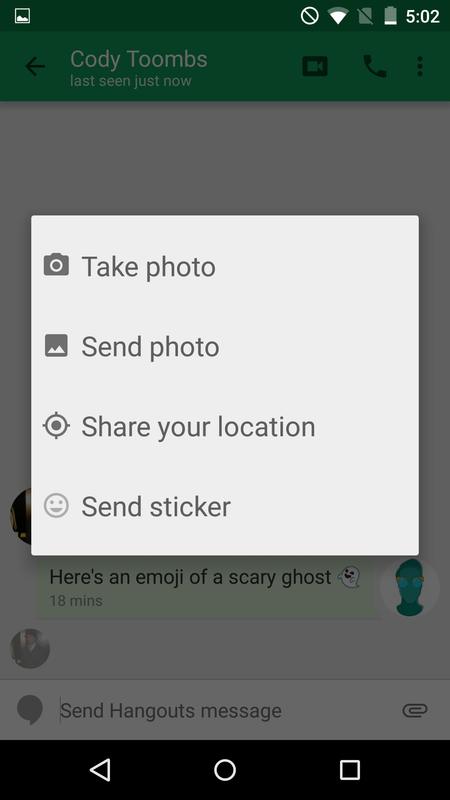 When opening one of these options, the app's toolbar recedes off the canvas to make room and keep messages visible. 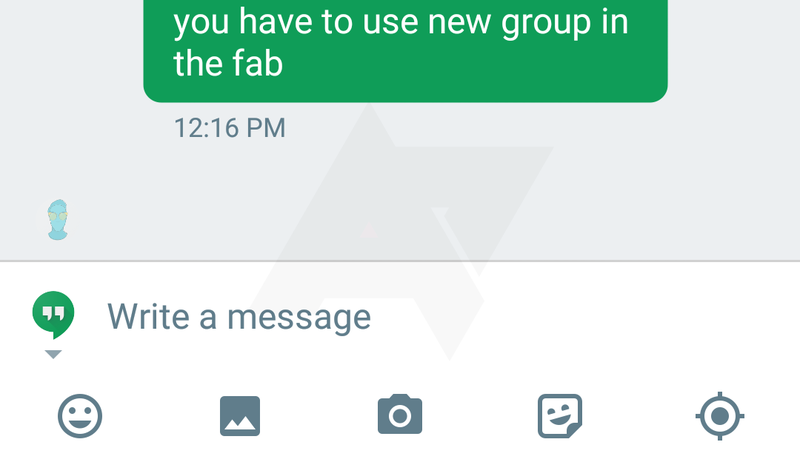 Once you've typed a message or made an attachment, a big FAB will appear to send. 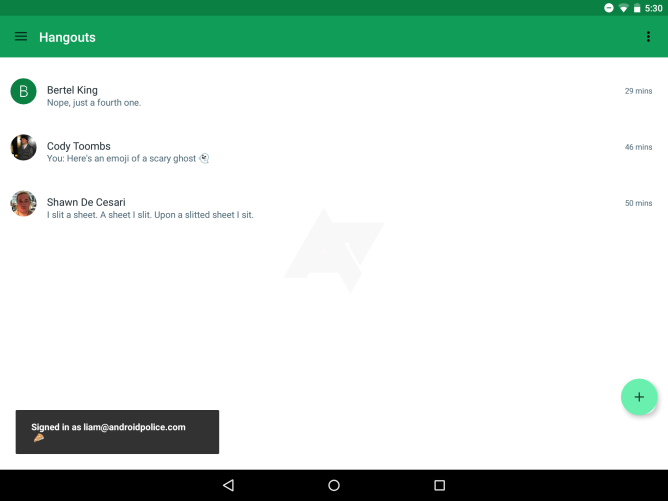 As you'll see below, the image selection interface also has its own FAB in case you want to go to the document view (which was the default behavior in 3.3). 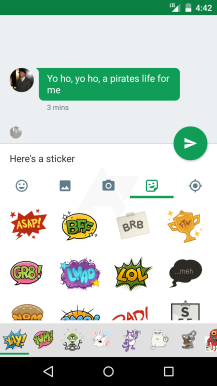 Whether this is a good use of the FAB is debatable, but users asked for FABs in Hangouts, and it looks like Google isn't skimping. To see details about each message, copy text, or see a contact card for your conversation partner, just long-press their avatar. 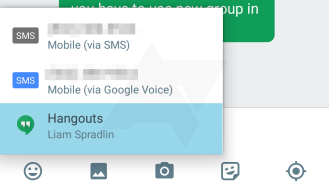 With SMS enabled, a dropdown appears on the left side of the message box with the option to manually switch between messaging options, similar to the current version of Hangouts. 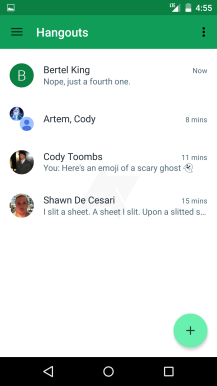 Unfortunately, despite the strides Hangouts 4.0 has apparently made so far in the chat screen, there's still not an actual tablet layout. 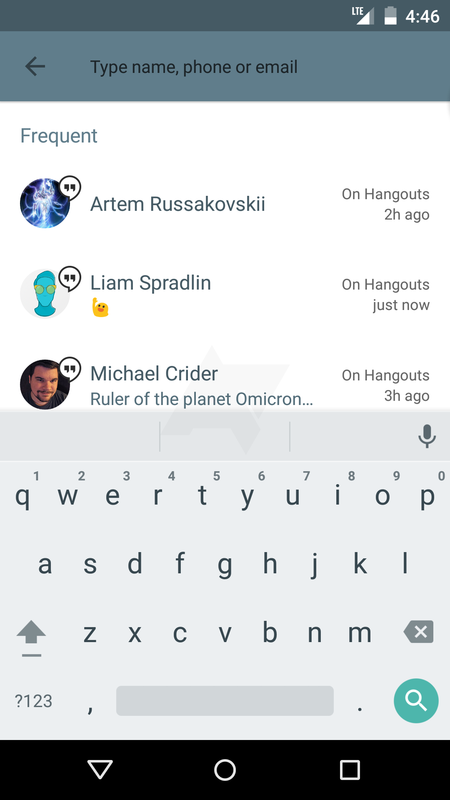 Unlike the days before the green UI, where users could at least enjoy a split-pane view, Hangouts presents itself as one big pane in 4.0 as of right now. Of course it's worth reiterating that anything (including this) can change before release. 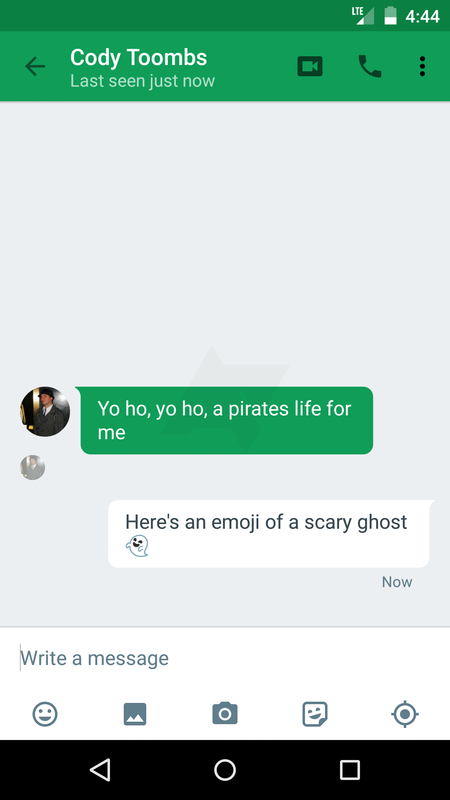 Let's hope it does. 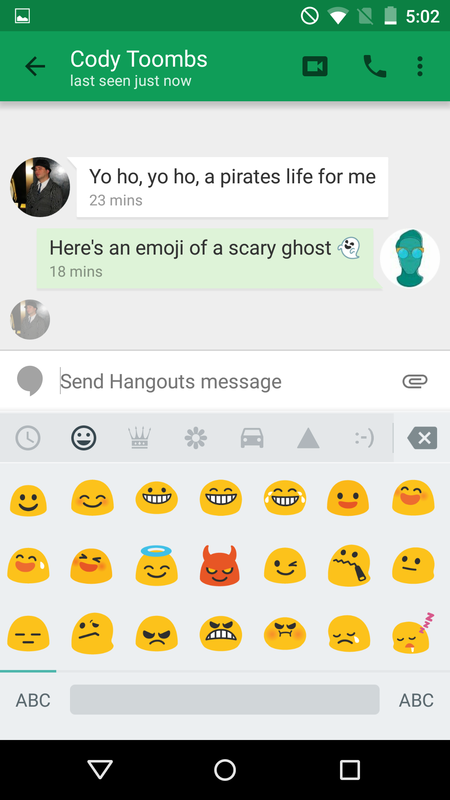 That's it for Hangouts 4.0 for now. 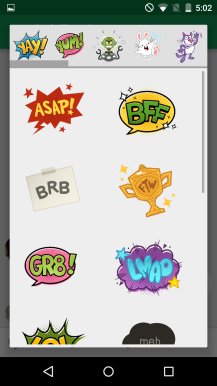 As with any unreleased app, there's no way of knowing when the official release might happen or what might change between now and then, but here's hoping we hear more soon.